Pregnant Snow White asks the Blue Fairy how her child will know she is the Savior once it it is time for her to break the curse. The Blue Fairy assures her that she will know. She leaves Snow and Charming. 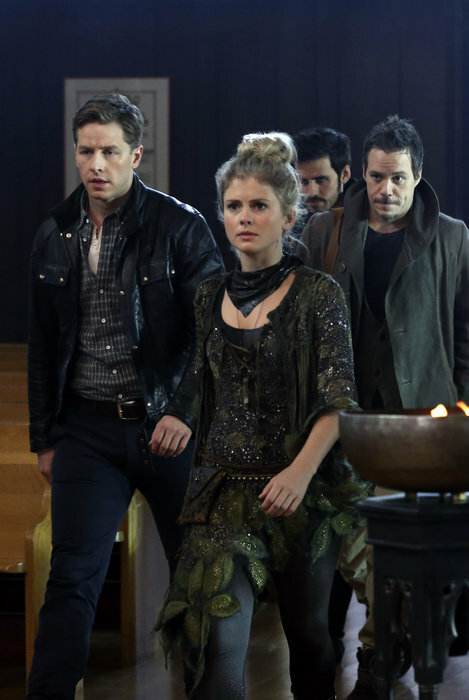 Charming tells Snow that life is full of twists and turns and that this curse is just another turn. He tells her the future may not be how they expected but it can still be a good one. Rumpelstiltskin is thinking of Baelfire. He is interrupted by Belle. He tells her that today is his son’s birthday and that they should be together. He tells Belle that he will not have a happy ending. Hook and William walk through the forest. Hook is determined to find a way off the island. William encourages him to get back to the ship. Hook is ambushed by Tinkerbell who holds him at knife point thinking he is a Lost Boy. He recognizes her as fairy and tells her she should be helping him get his happy ending. He explains he has a way to kill the Dark One and seeks revenge for the Dark One killing his love. He offers Tinkerbell some rum. Henry is outside at school. He is sitting down feeling sad. Mary asks him why he did not turn in his homework. He tells her he does not fit in. His real mother gave him up and he does not believe his adopted mother really loves him. Mary gives him the book of Fairy Tales. She tells him the book appeared in her closet like magic as she does not remember it. Henry glances over the book and becomes intrigued. He asks to borrow it and she tells him he may keep it. He flips the pages and finds a picture of baby Emma. Pan and Felix go to the well to start the curse. He tells Felix he needs one more ingredient and that would be the heart of the one he loves most. Felix looks confused and asks if that would be Rumpelstilstkin. Pan admits that he never loved his son. He tells Felix love does not have to be romantic or family and it can simply be the one who has shown him the most loyalty. Felix becomes frightened as he should be. Pan takes his heart and crushes it to dust over the well. Felix dies. Gold explains a plan. He believes I can use the scroll to break the curse. There will of course be a price. We do not see Pan’s Shadow watching us. We go to Gold’s shop where Mary sees a Blue Unicorn made of glass that once hung over Emma’s crib. She and Emma talk about how things could have been different. The nuns mourn over the body of Mother Superior. They are interrupted by David, Neal, Tinkerbell and Hook who have come for Mother Superior’s wand. The Shadow breaks in and attacks them. Neal has the coconut out ready to trap the Shadow but it is flying. They encourage Tinkerbell to believe in herself so she may use the pixie dust to fly. Tinkerbell concentrates and is able to use the pixie dust and light a fire in the coconut. She flies to the Shadow who becomes trapped inside the coconut. She comes back down and they toss the coconut into fire destroying Pan’s Shadow. Once the Shadow is destroyed Mother Superior comes back to life. She tells Tinkerbell she has earned her wings back. Mother Superior gives Neal the wand. They return to Gold’s shop and give him the wand. Everyone is happy to hear that Mother Superior is now alive. Gold places a sleeve on Henry’s arm. He explains that this is the sleeve he had taken from Greg and Tamara that can stop a magical being. Henry lays down and Gold uses the wand to switch Henry and Pan back to their bodies. I can tell it worked as the body shakes. Pan is unconscious. We leave to find Henry who we had instructed to get the scroll. Gold stays behind to deal with his father once he wakes up. We catch up with Henry. Once I touch the scroll it knocks me unconscious. Pan wakes up and realizes he is back in his own body. He asks Gold why he did not kill him in his sleep. Pan sees the sleeve on his arm. He tells Gold that he never loved him and found him to be a burden even as a baby. He then reminds Gold that he is the once who created that sleeve and transports it from his arm to Gold’s. Pan knocks his son around and leaves him on the ground. Gold desperately tries to remove the sleeve even considering cutting off his own hand. I wake up. We are interrupted by Pan who freezes all of us in place. He tells us he going to kill us starting with Neal. Gold shows up and stops him. Gold tells Pan that he now accepts his fate and must do the right thing. He tells both Neal and Belle how much he loves them both. He then reminds a confused Pan that he too removed his Shadow. Gold’s Shadow flies by delivering to him his dagger. He stabs his father who loses his youth and becomes a grown up again. Pan begs Gold to stop while promising that they can start over and be a family. Gold pushes the dagger all the way in killing Pan which in turn kills him too. They disappear. Pan’s spell wears off and we can move. Neal fights back tears but Belle cannot. She drops to her knees weeping. I am shaken up but I take the scroll. Everyone encourages me to break the curse so that Gold did not die for no reason. I explain to them that breaking the curse means that Storybrooke will disappear and everyone will go back to where they came from. This surprises everyone especially Emma. I tell her we will be sent back to the Enchanted Forest except for Henry who was born here but she can stay with him because she is the Savior. We go the border. Henry quietly comes to me and tells me he should have never sought out Emma to break the curse and none of this would have happened. He tells me he now knows I really love him. I explain what I did was wrong and there should have never been a curse. Emma says her good byes and tells Neal that she is sorry he has to go back. Hook tells her that he will never stop thinking of her. I then explain to Emma that once she leaves Storybrooke both she and Henry will lose their memories of this. I tell her that I will create new memories for her. They will be good memories where both she and Henry believe they have always been together. I watch Henry get in the car and leave with Emma. Now I turn to use my magic to transport us back home as the curse surrounds us. Emma gives birth to Henry in prison. She does not want to hold him and tells the doctor she cannot be a mother. With her memory altered Emma now remembers changing her mind and taking the baby into her arms. An alarm clock rings. Emma wakes up. She turns on some music and makes breakfast. Henry sits down with her to eat. Someone bangs on the door and she is confused. Emma turns the music down. When she answers it she does not recognize Hook. Hook tells her that she will not remember him but her family is in danger. Emma tells him her family is here referring to Henry. Hook tries to kiss her thinking it may remind her. Emma knees him and tells him to leave. She slams the door in face and goes back to breakfast with Henry. Next Next post: Jamie Chung (Mulan) is Engaged!